The sole 11th generation member, the Suppin Utahime! This girl is charming as heck and destined for greatness. I love how you included my own personal nickname for her, along with the photo that inspired it. 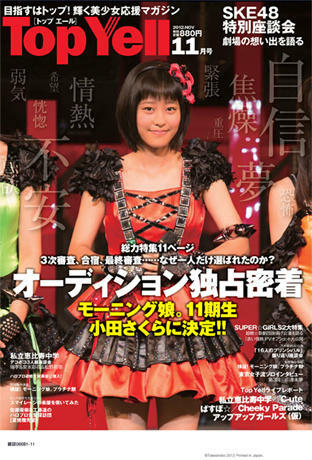 She is also yet another member to join Morning Musume after having previously failed a H!P/Tsunku-driven audition (finalist for 2nd gen S/mileage), joining the ranks of Miki Fujimoto (made the top 100 for 4th gen, didn't make the finals), Reina Tanaka (finalist for 5th gen, disqualified for lying about her age), and the entire first generation (the initial rock singer audition won by Michiyo Heike). I'm looking forward to a bright future ahead for her and the group. Can she live up to the hype??? More audition footage from the recent ep of Satoyama Life. Not bad, though we couldn't really (IMO) properly see her dancing due to that camera shot being awfully close. Another UL of the video, this time with higher-res viewing options. FYI, the ads at approximately the 01:30 and 03:00 marks appear to be embedded right in the vid, leading me to think that it was recorded off of an online broadcast/stream. 「この地球」モーニング娘。11期—在线播放—优酷网，视频高清在线观看 A clip of her singing acappella....she is amazing! With two shades of pink already taken, I think it's a good fit for her. Miracle who now? Second concert ever b*tches and sounds this good! Sakura playing 20 questions. Or in this case, 52 questions. Wow that was amazingly cute! I especially liked her answer to "which member is your rival?" Sakura: "Sato Masaki, because she's a genius." Speaking of genius, the part at the end where they secretly test how honest she was about her favorite foods was brilliant! If you only watch one part of this video, I'd recommend this part at the end! - A bunny that behaves like a cat. - Cats! I have 5 of them at home. Do you have a treasure you call your own? - Yes. It's the teddy bear that has been with me since I was born. What made you want to become an idol? - When I was 3 years old, a friend of mine got really into Morning Musume, and she kinda got me into it as well. 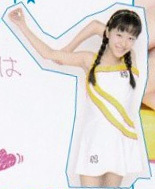 What was something tough that has happened to you since you joined Morning Musume? 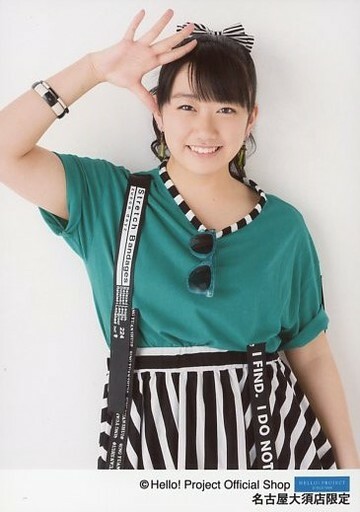 What was something that made you happy since you joined Morning Musume? - Getting along with my senpai! What made you happy to have joined Morning Musume? - When everyone started praising me about how my manners have improved since. What was something that surprised you the most after joining? - That Tanaka-san is the same whether in public or in private. What is something you want to learn from among any of the members? - Tanaka-san's sense of rhythm. What would you like to change about any of the members? - I wish Sato Masaki-san wouldn't just forget so easily that she just got scolded by someone else? Who is your rival among the members? Who do you find easiest to talk to among the members? - Suzuki Kanon-san. We get along very well! Who has changed the most since your first impression of them? - Ikuta-san. I noticed how much of a good senpai she actually is. Even though she was very open and friendly at the beginning, she has become stricter since I've joined. Something you would like to say to the other members? - I'm sorry I keep making you guys angry with me. What is your favorite song in Hello!Project? - C-ute's Midnight Temptation. I love singing it in karaoke. Is there anything you hate to eat? Your favorite type of clothing style? - Something with a fluffy feeling, a bit like mori girls (forest girls) style. Is there something you are bad at? Something you are good at? Is there anything you want to try doing? - Starting conversations with the senpai. Usually they are the ones who strike up a conversation with me. If you could be reborn, what would you want to be reborn as? Is there any hairstyle you want to try? - Kudou-san's extremely short cut. Is there anything you would like to do if you were not in Morning Musume? - Um, a hotelier? We had a school trip that would have simulated this but I didn't get picked, so I wanted to try it. Name 3 things you want to do in your life. Where do you most want to go now? - Home. Yes, in my hometown. I want to see my cats. If there is any one wish you can be granted, what would it be? - I want to become someone who will never be confused or unsure. If you were to go to an amusement park, where would you go first? - I'll get on the nearest ride from where I am! What is something that moved you lately? - When I saw Michishige-san and Tanaka-san speaking to the 9/10kies as allies (implied, on equal terms) about serious stuff. It felt like they were able to discuss things that had happened to them and I felt very touched just by watching them. What is something that made you cry lately? - When I got a solo part in the medley, when I saw Sato-san get upset, I found myself getting upset too. What is something that made you happy lately? - I managed to talk a lot with Tsugunaga-san. (Q: How was she?) She was exactly like she acts on TV. Like, she told me not to call her Tsugunaga-san, but to call her Momochi-senpai, and to drop the formalities. How do you release your stress? What is something you can't stop doing? - I couldn't stop eating dried sea urchin eggs. What do you do during your breaks in school? - I'll definitely step out into the hallways and walk around. I'll usually call out to others for no particular reason and pass notes under the table at school. What is something you would like to point out about the song, "Help Me!!"? - During the chorus, it's very important to match the brightness of the lyrics to the rhythm of the song. Because the lyrics don't quite match the beat, we have to be careful when we sing that part. What is something you wuld like to point out for the dance in "Help Me!!"? - Having to be in formation with everyone else. There's a lot of movement and changing of positions so I have to be careful about keeping in step with everyone else. Which part of the dance did you struggle with the most? - When we have to move our upper bodies in a square-ish, boxy way. I can never seem to move my shoulders the same way as my senpai. I had to keep watching the dance shot over and over again to try and fix the problem. What were your thoughts when you first heard the song? - That even though there's a new member who just joined, the song is still really adult-like. I was surprised. I thought we would get something like Pyoko Pyoko Ultra again since I just came in as a new member. What is something that makes you want to go "Help Me!!"? - I still think I really need help remembering how to bid farewell to everyone properly. I can never remember how to do it properly, and recently there was the Hello!Project concert with all the senpai who came to visit, so it was really tough then... (Q: Like who?) Um, like Abe Natsumi-san? Is there anything you want to tell people who will be listening to "Help Me!!" for the first time? - I'm sure there will be parts when on the first listen you will go "eh? who just said what? ", and that because of the complex melody, it's easy to mishear lyrics. Also there are the spoken parts where you have to figure out who's actually talking, and I feel like there are a lot of places where you will want to hear again, so I hope that everyone will keep it on repeat in order to figure out all these things! What are the things you have to be conscious of as an idol? - A lot of etiquette, like having to sit down with your legs fully closed and knees touching. Usually at school my skirt is really long so people can't really tell if I'm sitting properly, but after becoming an idol I have to wear short skirts more often, so I have to pay more attention in that sense. Is there anything you want the fans to notice about you? - I would like the fans to watch over me as I try my best to gel with the rest of the members. What is your goal for the year? - To learn how to use my time productively, like remembering all the dances before going to rehearsal, and studying for tests in school, basically having to balance both school and work at the same time. Lastly, do you have anything to add? - Somehow, I always feel very odd when my senpai see my profile videos. And for today, I'm very glad to be able to do a shoot here in the Help Me!! outfit and in such a relaxed setting. Thank you! All 52 questions! I refuse to translate after that. EDIT: @Slack: Lmao I laughed really hard at the way the staff are basically trolling. I mean, seriously. I wonder how Oda feels after she sees the actual video release. Automatically becomes one of my favorites.